Getting from Chiang Mai to Chiang Rai is straightforward, although the highway between the two northern cities stays perpetually busy. Buses require between three and four hours to cover the 114 miles (183 kilometers) of mountainous road along Thailand’s Highway 118 and Highway 1. If a few winding hours on a bus isn't very appealing, your only other options are to splurge on a private car or rent a vehicle and drive yourself. The nearest train station for Chiang Rai is in Chiang Mai, so going by rail isn't an option. Instead, grab a cheap bus or hire a private driver. Chiang Rai is often touted as a smaller, cuter alternative to Chiang Mai, but don't turn up expecting a small town in the mountains. As Thailand's northernmost city with any oomph — it's the last stop before Laos — Chiang Rai is busy. Like Chiang Mai, Chiang Rai is also plagued by traffic and horn-happy drivers. Gridlocked roads, particularly during the high season, increase the time required for getting from Chiang Mai to Chiang Rai. But Chiang Rai certainly has its charms. The Golden Triangle where Burma, Thailand, and Laos meet is only 34 miles from Chiang Rai. The city absorbs some of the culture and attitude from its northern neighbors. Bangkok seems very far away. Strangely enough, most travel agencies around the Old City in Chiang Mai don’t even bother with booking buses to Chiang Rai. The ticket prices are too low to make a profit. Instead, simply take a tuk-tuk to Chiang Mai’s Arcade Bus Station (the northern bus station) and book your own ticket. The cheapest bus tickets are around 140 baht (less than US $5). Buses leave at least every hour, sometimes even more frequently depending on the class of bus you choose. The most popular company is Greenbus. Get a ticket from the kiosk, and then approach the appropriate counter to purchase your ticket once your number is called. The staff all speak enough English to make the transaction quick and easy. You can typically book on the same day that you want to travel, however, you should book online or one day in advance during busy holiday times in Thailand. Buses to Chiang Rai from Chiang Mai are air conditioned and fairly comfortable, with narrow overhead storage and room beneath the bus for larger luggage. Seats are assigned at booking; book together if traveling with someone. The first-class buses have on-board squat toilets, otherwise, you’ll make one quick 10-minute stop for a toilet break along the way. Depending on city traffic and what time you leave, the bus from Chiang Mai to Chiang Rai takes between 3 – 4.5 hours to cover the 114 miles. There are two bus stations in Chiang Rai: the new station located around five miles south of the city and the old station located directly in the center of town next to the night bazaar. Your bus will stop at the new station in the south (Terminal 2) first, but unless you want to proceed directly to the famous White Temple, stay on the bus until the second stop at the old station (Terminal 1) in the center of town. If you accidentally get off at the first stop, minibusses and songthaews (pickup truck taxis) make the 15-minute run between the two stations for only 20 baht. If your hotel is in city limits, you can easily walk; otherwise, there are always plenty of drivers on hand at the station. Approach the friendly tourist information counter inside the station for directions to your hotel and a free map. The bus station is just one street to the east of a traveler epicenter with bars, restaurants, and guesthouses. Take a shortcut through the night bizarre to get there. Flying between Chiang Mai and Chiang Rai isn't a very practical option. You can fly from other places in Thailand directly to Chiang Rai. 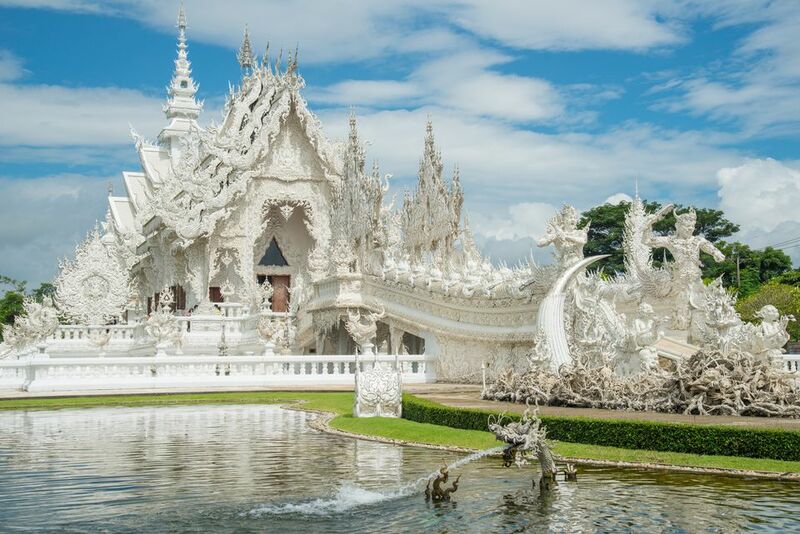 Flights by AirAsia, Nok Air, and other carriers service Chiang Rai’s Mae Fah Luang-Chiang Rai International Airport (airport code: CEI), however, nearly all domestic flights pass through Bangkok. Tiny Kan Air sometimes has charter flights from Chiang Mai to Chiang Rai, but schedules aren't always reliable. The airport is located a little less than six miles from town; fixed-rate taxis are 200 baht to the city center. You can rent a car in Chiang Mai and drive northeast on Highway 118 then Highway 1 to Chiang Rai, but don't do so unless you're practiced at driving in Asia. Although some travelers make the journey by motorbike, only experienced drivers should brave the busy superhighway. The fast-moving thoroughfare is unforgiving with mountainous turns often clogged by buses and trucks.